Happy Monday! Week by week passed very quick. I have been busy last week with some matters so I was not online much for blogging and tweeting. I will try to reply some of your comments after posting this. Kids' lunches have been provided by school catering last week during my absence to make bento. This morning, I am back to prepare kids' bento. I cooked beef & potato stew in my rice cooker. My rice cooker is multi-functions rice cooker that not only can cook rice in it but also it can be used to cook soup, stew, porridge, and some other functions. It is very convenience for cooking in the morning. Especially to cook stew, it is very quick plus meats are tenderized too. I don't know about other kids but my kids are a little bit choosy when it comes to beef. Most of the time when I cook beef for them, I have to cook it very tender. Otherwise, they won't eat it and complain that the beef is too hard to bite. I put beef & potato stew in the thermal box. And inside the stainless box, I put stir fried chayote, salted duck egg, cherry tomatoes, and rice rolls. 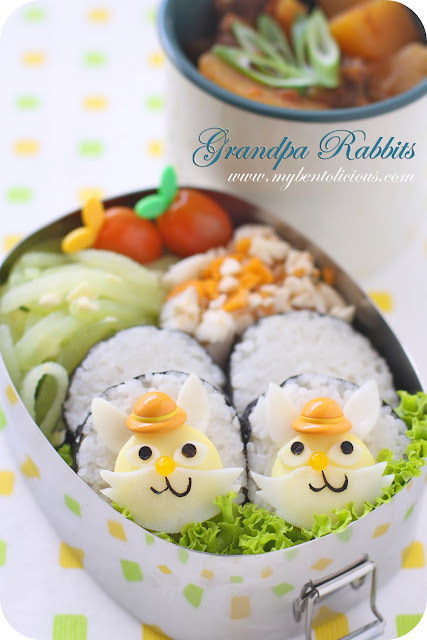 Decorated the plain rice rolls with grandpa rabbits. I used hard boiled egg, nori, egg white sheet, jelly balls, and hat picks to make the grandpa rabbits. Happy bentoing!! @Oen Priyanto : Thanks a lot for your sweet comment! it looks so sweet and very tasty. i'm very impressed and inspired - very clever of you to take, hard-boiled eggs for the rabbits. How did you stick the eggsheet to the boiled egg and the nori to egg sheet? i can't stick it properly to the eggsheet. @Ni-chan : Thanks a lot Ni-chan! @mama elaine : Thanks a lot Yuli! I used angel hair pasta to stick both nose and the white egg sheet (lower part of the face) and I put a little bit of olive oil to stick the white egg sheet on the part of hard boiled egg (eyes). Lia, these are so perfect! The rabbits are just too cute. Your kids are sure lucky to have you as their dedicated mom. funny grandpa bunnies lia, i love their beards and hats, like they are retired and get to let their hair grow out and spend their days in the garden or the park! So original, smiling from your sweet bento and megan's wonderful description of these retired bunny grandpas in her comment, lol! Such a caring and dedicated mom you are to take such care with these beautiful bentos and cooking them "just so" to your kids liking! Hi Lia. I'm new to your blog, but boy am I impressed! love how you use ingredients that otherwise would never make it into the bento, like the jelly ball. I'll be on the lookout for your next creations!